Mygazines is a free community site for reading, sharing and archiving magazines. The service is free for reading magazines, but if you want to upload magazines you need to register for an account. 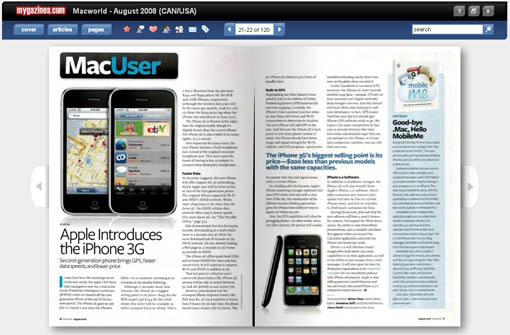 Users can upload magazine articles to the site and customize the articles they uploaded in a Mygazine. Not only magazine articles but other things like brochures, pamphlets etc can be uploaded to the site. Myganizes is organized in broad range of categories from Comics to Technology, so there is a good chance that you will find your favorite magazines out there. The uploaded magazines will give you a feel of reading a real magazine in a Flash interface. The articles open in a book like interface, you can flip through the pages, rate the article, comment on the article, share it via bookmarking sites. Users can also save these articles to their mygazines, share via email and tag it for later reading purpose. Overall the site looks good and there is already lot of content. It is good for people who doesn’t want to pay for a magazine to read few occasional stories now and then. Thanks for spotting this website, what a good idea, it looks a bit like a free zinio website.